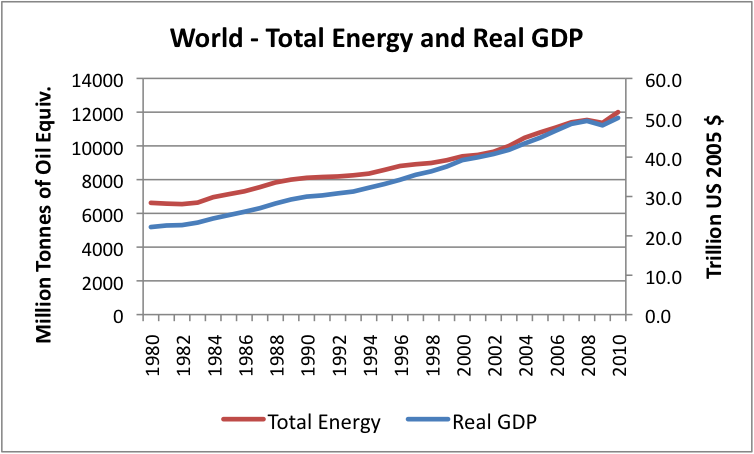 This graph summarizes a series of national-level graphs and it indicates an increasingly tight coupling between energy growth and GDP growth. As Power Line and Oil Drum point out, this has implications for any ability to reduce, at least in the near-term, dependency on CO2-based energy in our economies. Aside from the fact that CO2-based energy has never been shown to be inherently bad—anthropogenic climate change, according to an increasingly deep and broad fossil record, seems a non-event—I want to talk about some other implications of this coupling, and I’ll do that with the explicit assumption that GDP is a good enough stand-in for the quality of life of the world’s inhabitants. We have reached a point in the improvement of our quality of life where it’s no longer possible, for instance, merely to plant more acres in order to grow more food; it’s no longer possible merely to hire more calculator operators to do more calculations; it’s no longer possible to do more science simply by observing with the naked eye, or with crudely ground glass lenses, the world around us. It’s no longer possible to increase our comforts in our homes simply by burning more wood in the fireplace. We need more and better technologies. It’s technology that produces the medicines that help us defeat yesterday’s killer diseases and will help us against today’s and tomorrow’s, it’s technology that produces and improves the computers underlying and controlling our infrastructure and personal activities, that manages the technologies that let us do the science that make our lives better and that underlie tomorrow’s technological and scientific advances that continue this spiraling cycle of improvement. But each new advance in technology needs more energy to sustain it and it took more energy to develop it. The increase in energy use shown in the graph isn’t driven only by population growth yielding more people to consume energy; that growth is driven by the increasing energy demands that an increasing quality of life represents. We’re faced with a choice, then, as GDP increases and energy consumption increases become tied to each other: do we continue to develop our technologies and the energy to support them so that our GDP, our quality of life, can continue to improve, or do we say enough—this is as good as it gets, stop the improvement train? I decline the Malthusian solution. But to do otherwise requires more of that CO2-based energy, more of those fossil fuels. Whatever we might think of alternative energy sources, they aren’t ready for market. They can’t produce the energy in the amounts we need to supplement what we have, much less to replace much of it. Not only are market prices not able to compete—and forcing them would damage our economy even more than it already is—the production efficiencies aren’t there, either. The energy density of a solar cell doesn’t compare with the energy density of a unit of oil or gas, even if the cell will last longer than the unit of oil or gas. Subsidizing the alternate energy sources doesn’t answer the problem, either; this merely shifts the price from the utility bill to the tax bill. A partial answer, then, demands that we increase fossil fuel production, and this demands that the government get out of the way of this increase. Travesties like the Keystone XL pipeline delay must be undone. Off shore drilling must be allowed, dry-land drilling must be allowed, fracking must be allowed, and so on. The government’s regulations that impede these must be withdrawn. So, too must the regulations that enable frivolous environmental lawsuits and their delays be withdrawn. For example, despite three years of environmental study for the Keystone XL project, despite the existence of 25,000 miles of oil and gas pipeline already criss-crossing the Oglala Aquifer, additional suits are permitted. For example, a solar farm in the desert on the other side of the mountains from Los Angeles cannot deliver its green electricity to the city because environmentalists object to every plausible route along which the power lines needed to carry the electricity might run. For example, a wind farm off the Martha’s Vineyard coast has been blocked by NIMBYers convincing the FAA to rule that the windmills would present a hazard to aviation. Delays like these simply increase the importance of fossil fuel production. So, too, must the subsidies, which only inflate the cost of the thing being subsidized, whether oil and gas or “green” energy, be withdrawn. But the rest of the answer demands that we need energy from all sources. We need the solar energy, the wind energy, the nuclear energy (and cheap fusion energy is just around the corner. Still). But these can’t be forced into the market before their time. Solar energy remains roughly three times more expensive than fossil-fuel (CO2-based) energy for the consumer. Permitting requirements can double the cost of building a nuclear power plant, and we still don’t have a place set up in which to store spent fuel—even though a suitable location has been identified. When any other element of our infrastructure, a road or a bridge or a stretch of railroad line, for instance, has utility, then it can be sold on that basis. Again, so it is with “green” energy. When those sources have utility, when they are useful in the market place for the end users, then these can also be sold to us on that basis. Neither energy source needs to hyped on the basis, for instance, of the jobs that will be created. Those jobs will appear automatically from the need to produce to satisfy the market’s demand. This entry was posted in ethics, political economy and tagged ethics, politics by eehines. Bookmark the permalink. A minor point – the energy source set is carbon-based, not CO2-based. Much more important – many of us miss Steven den Beste’s writings; for me especially on energy. His archives remain available, and a search on “energy” returns many hits. http://denbeste.nu/cgi-bin/perlfect/search/search.pl?p=1&lang=en&mode=all&q=energy His “stardate” format is yearmonthday.time – if you wish to persuse them chronologically.